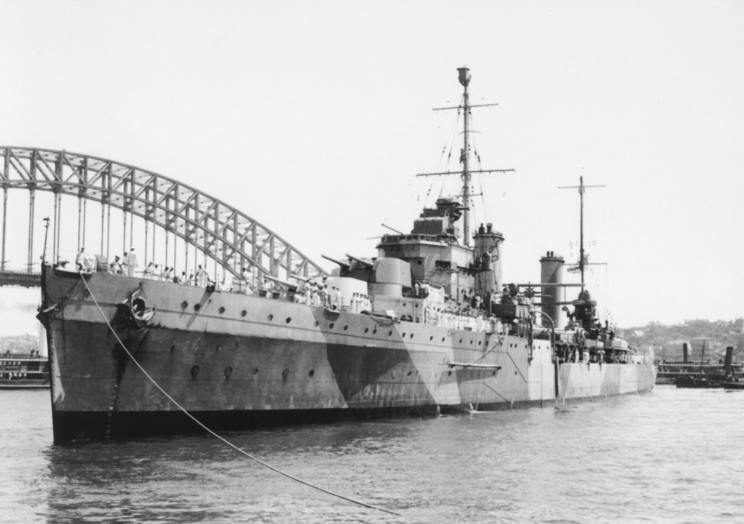 Ocetober 1941: HMAS Sydney seen in Sydney Harbour. The Harbour Bridge is seen in the background. Memorial to the HMAS Sydney, it stands on a hill overlooking Geraldton and the Indian Ocean in Western Australia in the dome there is one Seagull for every man lost in the tragedy, there is also a larger than life bronze lady looking eternally out to sea. It is said that the people who's job it was to design the memorial were on the site lost for inspiration, when a large flock of Seagulls flew overhead, this was the inspiration for the dome of gulls. There is, on the front of the memorial, walls of marble with the names of the men lost inscribed.